Most watch-car company partnerships are focused on blockbuster events involving speed, with official watches in screaming colours, bold racing stripes, and a cacophony of functions. The Breitling-Bentley alliance, however, is more about the laid-back spirit of grand touring automobiles—they can easily perform on the track, but their main goal is to embrace their owners in a luxurious, smooth ride. 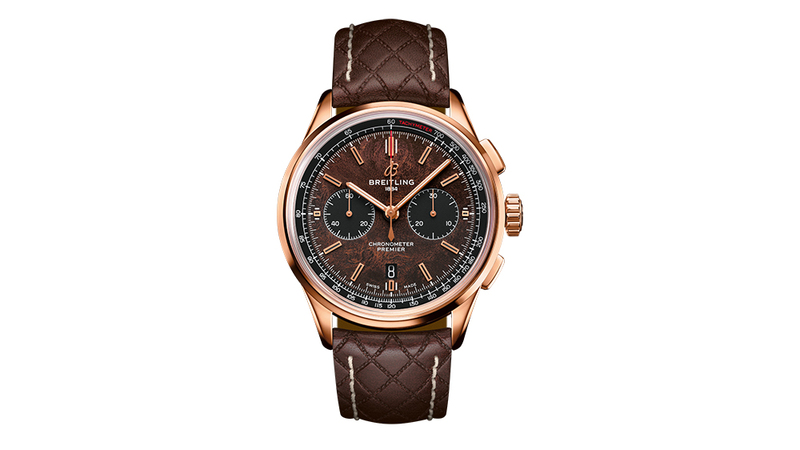 The Breitling Premier Bentley Centenary Limited Edition watch was launched simultaneously with Bentley’s Continental GT Number 9 Edition by Mulliner at the Geneva Motor Show and at the Baselworld watch fair. Bentleys are synonymous with luxury: wood panelling and hand-stitched leather interiors come to mind, but they are also famous racing cars—today, Bentley makes the fastest SUV on the market (the Bentley Bentayga, which posts its official top speed at 305kph). The Continental GT Number 9 Edition is a tribute to Bentley’s impressive track record at Le Mans. Between 1924 and 1930, the Bentley Boys, a group of wealthy British motorists who raced Bentleys in competition, won the 24 Hours of Le Mans race five times. Sir Tim Birkin, one of the legendary Bentley Boys, broke records in his number 9 car, a 4 1⁄2 litre Bentley, which later became known as the Blower Bentley, the first with a supercharged engine. The Continental GT Number 9 Edition by Mulliner (Mulliner was one of the original luxury car body makers, now a division of Bentley) is a tribute to the greatest of all the Blower’s racers, the second of the five Birkin team cars driven to victory by Sir Tim Birkin. A chip of wood from the original seat of Birkin’s 1930 No. 9 Blower, salvaged when it was restored, will be inserted into the centre of each console of the 100 Continental GT Number 9 Edition. Fun fact: the 1930 Blower was the original James Bond car, driven by 007 in the novels Moonraker, Casino Royale and Live and Let Die. 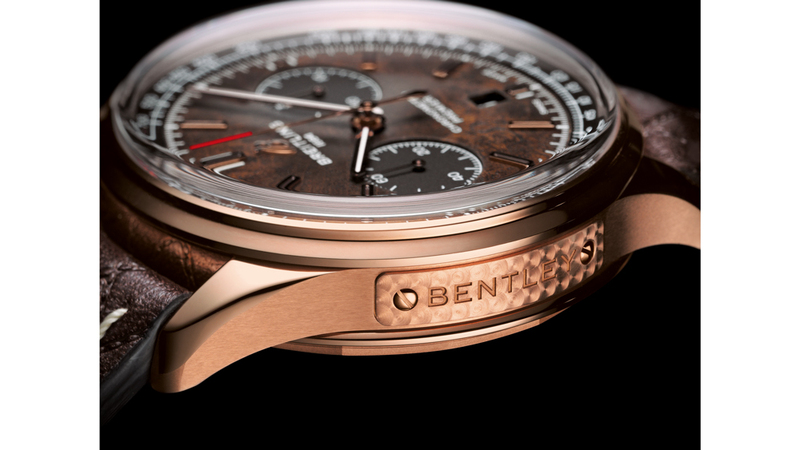 The Breitling Premier Bentley Centenary Limited Edition emulates the car, with an elm wood burl dial and a leather strap that mimics the diamond-shaped stitched pattern on Bentley’s leather seats. The wood dial is contrasted with black rather than white subdials and tachymeter ring, which is surprisingly as readable and signals elegance over sportiness. Also, it more closely resembles the colour combination of the Bentley Continental dashboard. The Bentley logo is inscribed on a plate on the case side. Just as the car is fitted with an elite engine (a 6.0-litre W-12 with 466kW), the watch contains Breitling’s manufacture movement, the COSC-certified calibre 01 chronograph, with a 70-hour power reserve. The Bentley collection, previously called “Breitling for Bentley” is now no longer treated as a separate brand but will be produced in special editions within Breitling’s “land” category of watches. The change began last year with the launch of the Premier B01 Chronograph 42 Bentley British Racing Green, inspired by the 1929 Bentley Blower. While Bentley’s Centenary Edition car is limited to 100 pieces, one for each year of its existence, the Breitling edition will be made in a series of 200 numbered pieces in 18-karat red gold (approximately $39,500) and 1,000 numbered pieces in steel (around $14,800 with steel bracelet and $14,000 with leather strap). Another fun fact: 2019 year marks the 16th year of the partnership between Breitling and Bentley, the longest running alliance between a watch company and a car company. It is also one of the most wearable everyday timepieces of all of the high-octane automotive/watch releases this year.